Lire is a new RSS app I recently discovered via MacStories’ Must-Have iOS Apps, 2017 Edition. It’s a fantastic RSS reader, save for one nuisance. Like a strong contingent of others, my ears perked up when I read Federico Viticci had settled on a new RSS reader for iPhone and iPad. 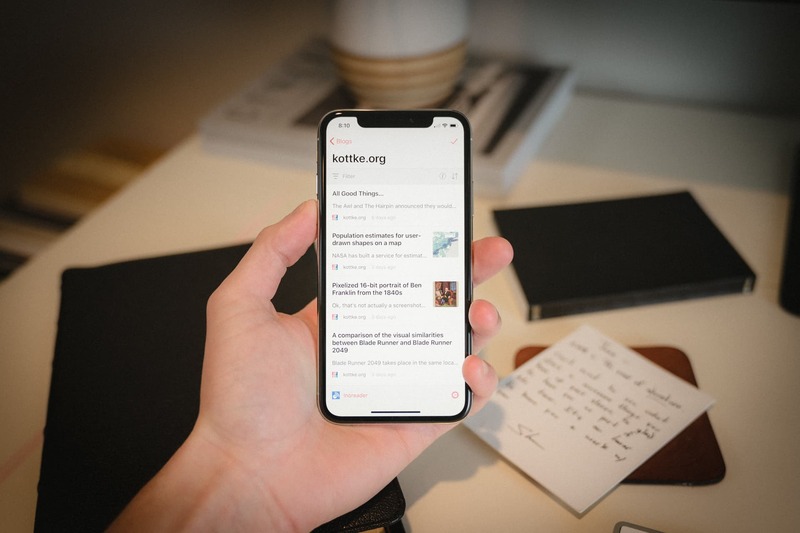 Lire came away as the new recommendation thanks to its homey iOS 11 design and its nifty text extraction tool to load full text of shortened blog posts (you know, those blog posts that show up in your RSS reader that say “Click here to read more…”). 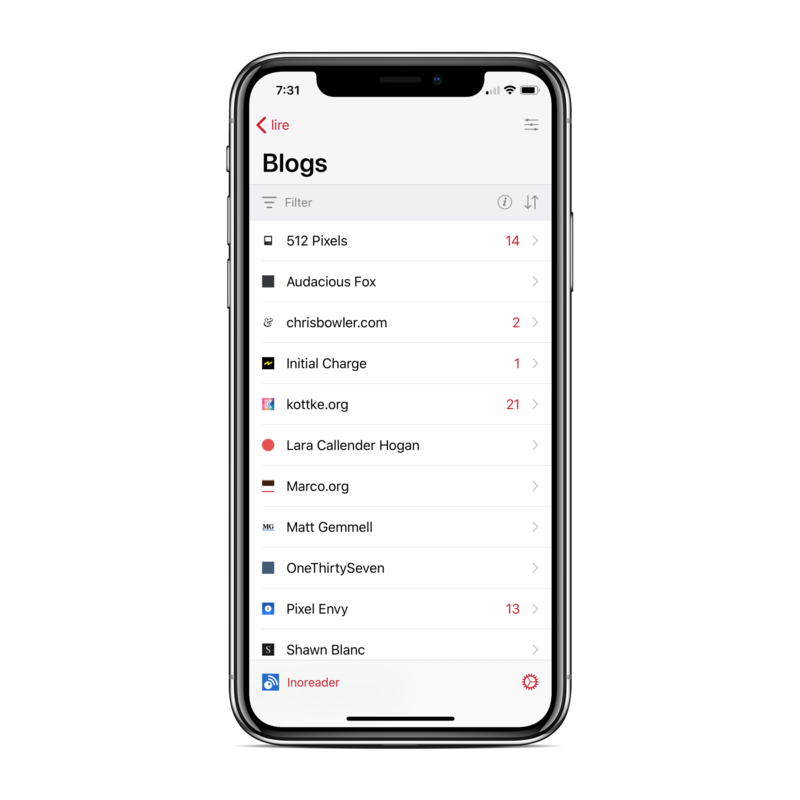 Lire is more expensive than other RSS apps on the App Store, and my defaultedness toward Reeder created some apprehension in deciding to buy Lire. Lire is great — I love the adherence to iOS 11’s design language1 and how quickly it synchronizes and caches read and unread articles. My favourite little feature of Lire, like the other greatest apps on the App Store, are its sound effects. These are icing on an otherwise delightful design cake. Lire’s aforementioned hallmark feature — that handy tool to extract the full text of an article to skip over that “Click here to read more…” chore — is exceptionally great and works like a charm. For anyone using Inoreader’s free tier, it even skips over those occasional Inoreader advertisements. However, this behaviour brings up my biggest complaint with Lire, and it’ll be why Reeder remains my go-to RSS app for the time being. Let’s say you’re reading a blog that creates original content and link blog posts (like, say, The Newsprint). All articles pop up in your feed and you tap on one when you’re ready to read. Some of those articles are original content and some are linked posts. Maybe you don’t even know which is which. On the left is Lire after tapping on a linked blog post here on The Newsprint. It takes you straight to the original content, making it look like the writing on The Sweet Setup is actually my own. The regular behaviour for linked blog posts is shown in Reeder on the right. Tap on the linked post in the feed list. Tap on the title of the linked post to head to the linked content. Lire’s full-text extraction tool skips step one when you tap on a blog post in the feed list and skips right over to step two. Once you tap on a blog post in the feed list, it extracts the full text from the linked content site and puts that in the reader (as seen above on the left). It skips right over the commentary on the linked post. Plus, worst of all, if you don’t know any better, you may assume the linked content is actually original content of the writer. 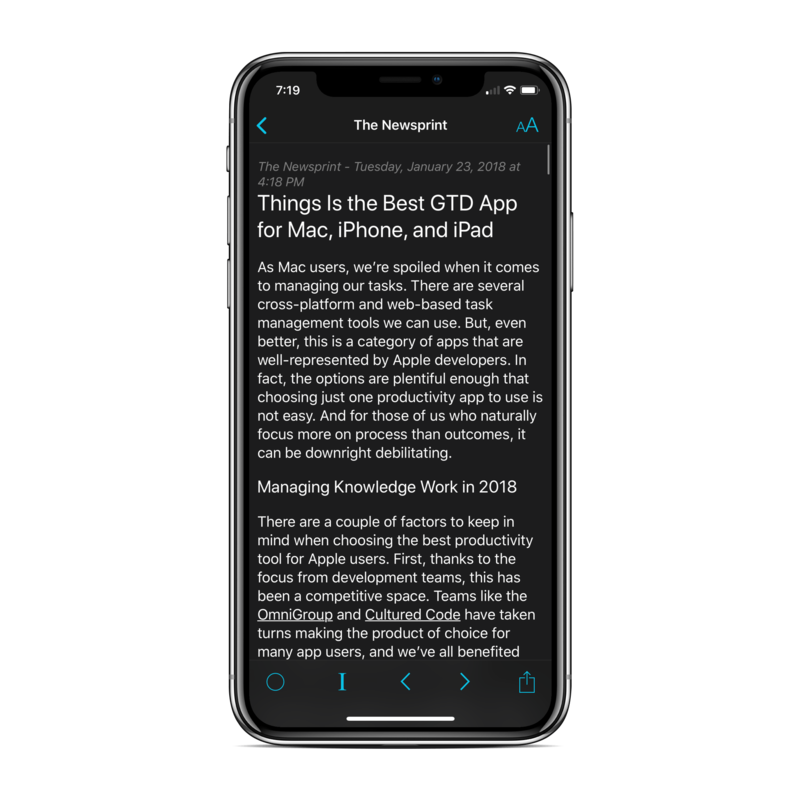 As much as I wish I could write as good as Chris Bowler, I can’t take credit for the great GTD app review over on The Sweet Setup — even though this is exactly how Lire’s full-text extraction tool portrays the blog post. “The Newsprint” is situated in the top-left corner and the title is the title of the blog post on The Newsprint, not on The Sweet Setup. However, the actual content of the blog post is taken from The Sweet Setup, not The Newsprint. I think this a no-no. 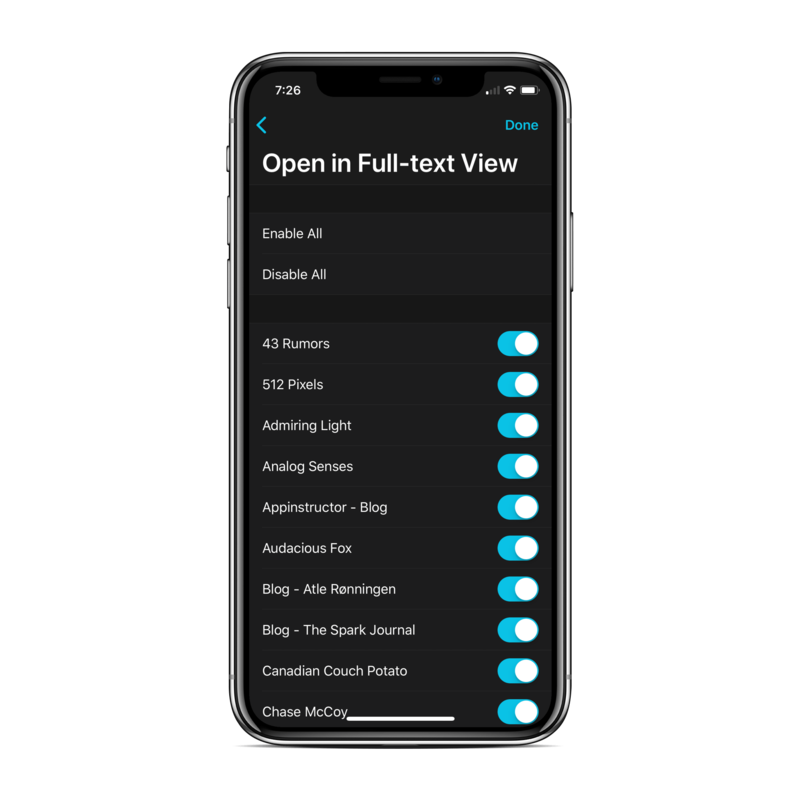 Of course, Lire’s developers have gone so far as to give you the option to toggle the full-text extraction tool, even allowing you to toggle it on and off on a blog-by-blog basis. But that gets rid of Lire’s hallmark feature. Full-text extraction is a brilliant feature when it skips over truncated blog posts and delivers the entire post right in your reader of choice. It also happens to be a nuisance with linked posts. Is this a deal-breaker? It will be for some. Otherwise, Lire is a phenomenal RSS app. So good, in fact, I think it would uproot Reeder for me if it somehow allowed you to toggle this full-text extraction behaviour on a post-by-post basis. Oh, and if it supported Feed Wrangler. My fingers are crossed for both features to be added/fixed in the near future. Update: I received an email from Lire’s developer discussing the interesting linked content behaviour in the app. He quickly pointed out the app’s ability to jump between the linked content and the original content from a specific feed. 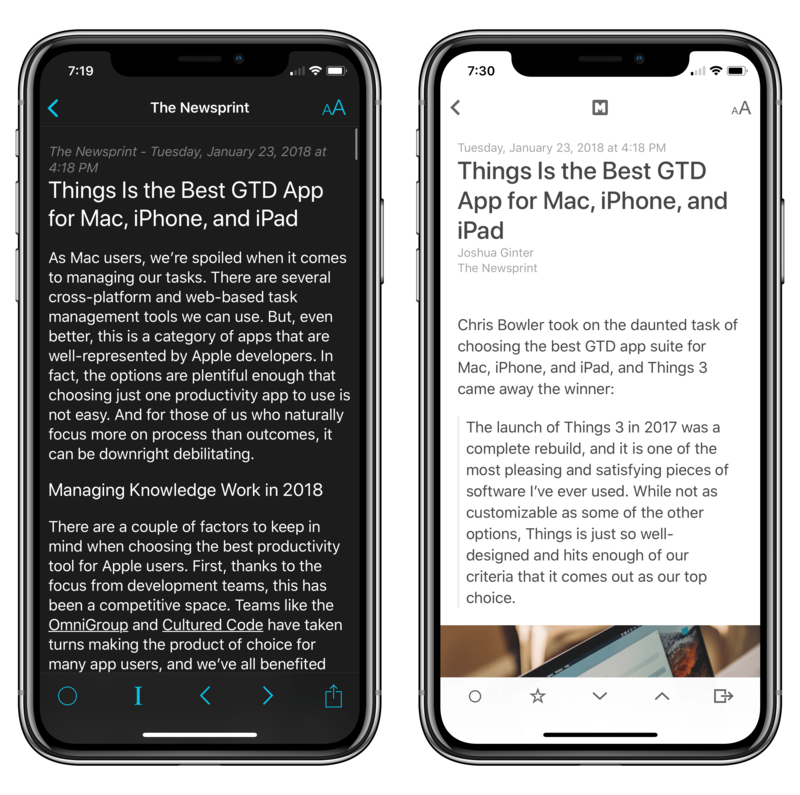 Once you tap into a linked post in the feed, you can scroll to the bottom of the linked content to tap a “Show original article” link, which then takes you back to the author’s original blog post. In the original post, you can tap the same link to take you immediately to the linked content. It’s a bit tedious — having to scroll to the bottom of the linked content to return to the author’s original blog post — but it is possible and is something I overlooked when writing the above. The developer showed openness to figuring out a better way to handle link posts, so my fingers are crossed for Lire’s future. If this changes for the better, there could be a new RSS winner on the horizon.